All 13 episodes of 'Marvel's Runaways' Season 2 to premiere on December 21! The Runaways return for the second season of "Marvel's Runaways" on December 21, exclusively on Hulu. This time, they're leveling up and working together as a team to take on their parents, the Pride, who are determined to bring them all home by any means possible. Take a look at the brand new trailer below. Eagle-eyed Marvelites will spot some new faces among familiar ones, as well as the infamous Hostel. Rhenzy Feliz, Lyrica Okano, Virginia Gardner, Ariela Barer, Gregg Sulkin, Allegra Acosta, Annie Wersching, Ryan Sands, Angel Parker, Ever Carradine, James Marsters, Kevin Weisman, Brigid Brannagh, James Yaegashi, Brittany Ishibashi, Kip Pardue, and Julian McMahon all return for the second season. 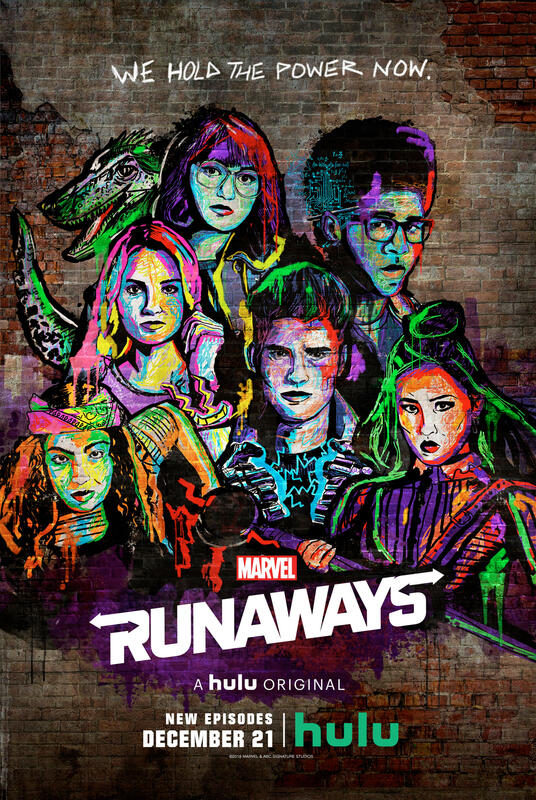 In Season 2, the Runaways have left their homes (and evil parents) behind and now have to learn to live on their own. As they scavenge for food, search for shelter, and take care of one another, our kids begin to realize, for better or worse, they're stuck with each other. And it's up to them to take down P.R.I.D.E. once and for all. But someone sent a mysterious message to Jonah... Is there a mole in the Runaways? Meanwhile P.R.I.D.E. is focused on finding their children, and Jonah has his own dangerous plan in mind.